Larvae host plants include Buuhinia,Croton,Common Cabbage Tree and other trees . When they poop and believe me they do. Never walk bare foot on their poop it burns like acid . 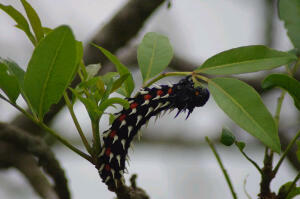 It takes about 1 week then they will eat all the leaves of a big tree normally about 100-500 larvae on a tree. Small and big larvae all eat leaves together . They are save from birds and other predators . Reblogged this on Photos of birds and their struggle to survive climate change /Be inspired by the beauty of nature.